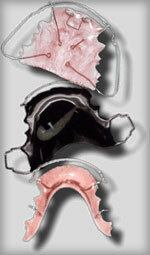 Removable appliances are used to retain teeth in their corrected positions. In addition, they are sometimes used before and in conjunction with fixed appliances to aid in treatment corrections. Removable appliances require care. Although, at first, you may notice an effect on eating and speaking, with only slight effort, you can quickly adapt to the use of the appliance.